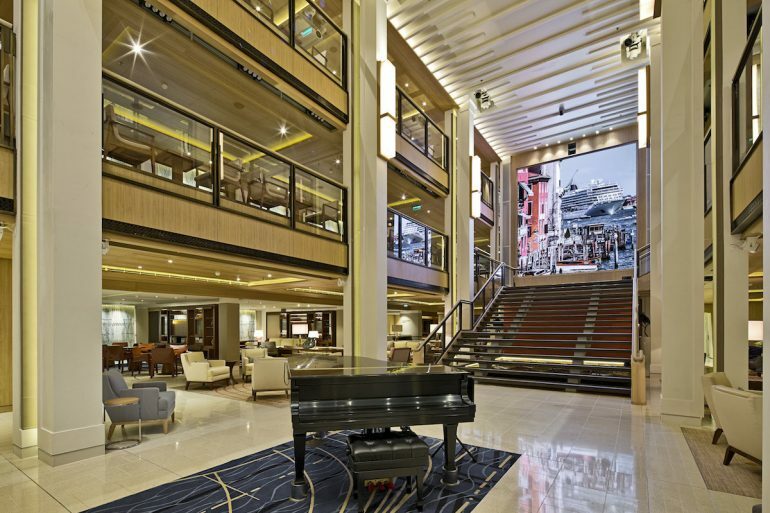 Viking Star soothes away everything — including the arrival of the elevator, every time. Life is pretty darn good when everything is so perfect that an elevator’s “ping” is your biggest problem. Let me explain. I’m currently aboard Viking Ocean Cruises’ Viking Star, an astoundingly beautiful, light-filled and exquisitely appointed mid-size cruise ship — but it’s not just the visuals that are making me go gaga. If this was a PowerPoint presentation, I’d be producing slide after slide studded with star bursts and exclamation points celebrating features that demonstrate a staggering commitment to quality and meticulous detail. Stuff like consistently fabulous cuisine (a WHOLE lobster instead of a mere lobster tail, anyone? ), a spa that has convinced me that … hmmm … maybe this flopping-around-in-bubbling-water thing isn’t so stupid after all, and a staff that exudes such cheer and enthusiasm that if they weren’t all so capable, I’d suspect they were poppin’ happy pills. And then there’s all the free stuff — Wi-Fi, a shore excursion at each port, bottled water, free-flowing wine with lunch and dinner, passenger laundry rooms, and access to the ship’s thermal suite. So essentially a guest can board, dine regally even at specialty restaurants, get tipsy, see the sights, immerse themselves in the healing waters of the spa, and wash their dirty underwear all without spending an extra dime. But back to that elevator “ping.” I’ve found that it’s the only thing that Viking Star lacks — completely. I can only assume that the Viking gods (and gods they are to have created a ship and experience as superb as this one) were so concerned with their guests’ comfort that they believed a “ping” might interrupt the relaxing, almost hypnotic musical soundtrack that pervades each deck’s serene ambience. So, time and again, I find myself missing the silently arriving car, sometimes catching movement seconds too late — sort of like watching as the doors of the 6:02 to Babylon close and the train begins chugging down the track while I’m still stuck on the platform at Penn Station. 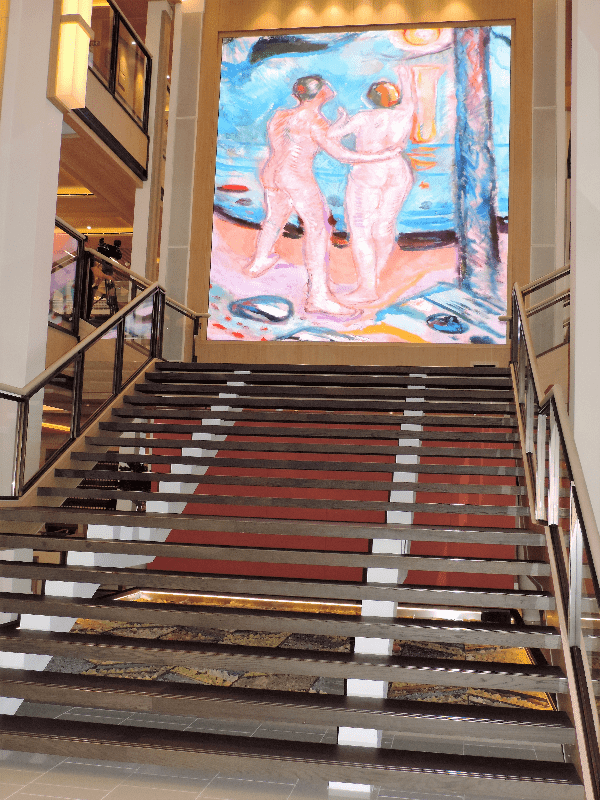 But aboard Viking Star, I guess it’s not really that bad because if I did always ride the elevators, I’d likely miss some of the incredible art that appears on the ship’s stair landings — art that I’m very well acquainted with by now. 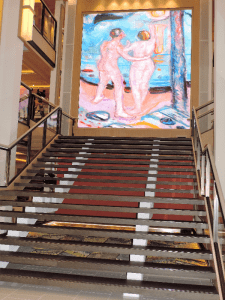 Throughout the cruise, I find myself interrogating fellow guests, asking how they feel about the quietly arriving elevators, whether they too are seeking that “ping” that would ease the commute from Deck 7 to 1. They look at me like I’m crazy. They’re probably thinking about the velvety corn chowder at lunch or the steak at Manfredi’s, the infinity pool, the spa’s snow grotto, and the cheerful staff. And certainly, they’re thinking that life is pretty darn good when everything is so perfect that an elevator’s “ping” is your biggest problem. 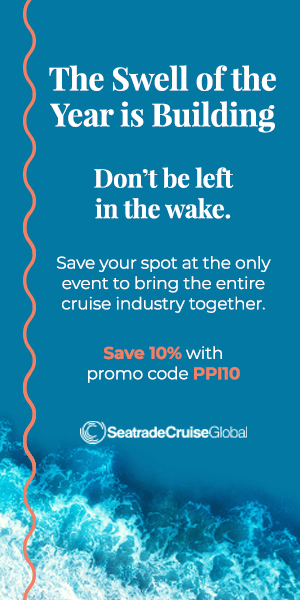 So when, decades from now, you become one of those nomadic old ladies who decides that it’s cheaper and more fun to live on a cruise ship than on land, this could be one of your “timeshares”….